Welcome! Things are still under construction. Please check back frequently as many there are many exciting updates and additions in progress. 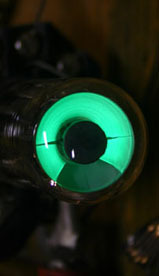 A magic eye tube is an electronic vacuum tube that provides visual indication, usually in the form of green light, on an area called the target inside the tube. The target is partially illuminated with the exception of the shadow area, which varies in size and shape depending on the signal applied to the tube. The phrase "magic eye" became a trade-mark of Radio Corporation of America in the mid 1930s, who introduced the tube as a visual tuning aid for radio receivers. Other names for the magic eye tube included "tuning eye" and "cat's eye" as well as its technical name, cathode ray indicator. 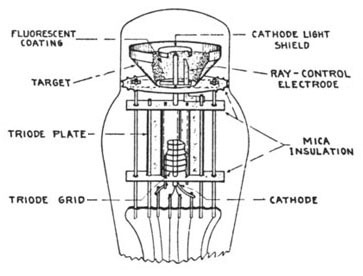 Occasionally, skeptics or pundits would call it an "idiot lamp"
The first magic eye tubes somewhat resembled a human or animal eye, with the glowing cone shaped target being the iris and the non-illuminated filament shield being the pupil. 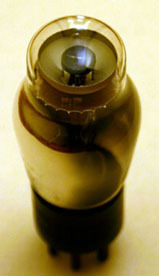 Over time, many different magic eye tube designs of various shapes and sizes emerged and the tube appeared in devices other than radios including military and commercial equipment. LIABILITY DISCLAIMER: magiceyetubes.com, its affiliates, or its registrant will not accept responsibility for any situation arising from the use or misuse of information on this site. The information contained in this web site comes from various sources such as radio books, magazines, miscellaneous literature, people I have met, tube manuals, and experiments I have conducted with various tubes. Please use caution if you work with the circuits in this site, as the high voltage required for tube operation can be fatal if misused. In the past, I have found many inaccuracies about eye tubes in substitution manuals, data sheets, and other literature. Within my site, tube numbers shown in green are those that I own and have actually verified on the bench. Those numbers in red came from a substitution manual or other literature and I have not yet verified the integrity of the data or substitution claimed.